Vietnam is holding live-fire drills in the South China Sea amid high tensions with China over disputed waters. A Vietnamese naval officer said the "routine" drills were being held about 40km (25 miles) off central Quang Nam province, outside the disputed area. Chinese state media denounced the exercises as a military show of force to defy Beijing. The drills come within days of an escalation in the long-standing maritime border dispute between China and Vietnam. Vietnam last month accused China of cutting the exploration cables of an oil survey ship. In a similar incident last week it said a Chinese fishing boat had "intentionally rammed" the exploration cables of another of its boats. China said that its fishing boats were chased away by armed Vietnamese ships in the incident last Thursday. The relationship between Vietnam and China has always been delicately balanced. As communist states with rapidly developing economies they are in some ways natural allies. But the dispute over sovereignty of the Spratly and Paracel islands has been a long-standing source of tension. Several Asian nations claim territory within the South China Sea, an area rich in fish stocks, potential oil deposits and incorporating strategically important trade routes. As chair of the regional grouping Asean last year, Hanoi actively promoted a multilateral approach to the problem. But Beijing prefers to negotiate with individual states separately. China's increasingly muscular approach raises alarm bells, especially perhaps in Vietnam, which was once occupied by its northern neighbour. More recently, in 1979, the two countries fought a border war. So this recent spat taps into a growing disquiet rooted in history. The fishing net of one of the Chinese boats became tangled with the cables of an Vietnamese oil exploring vessel, which was operating illegally in the area, and was dragged for more than an hour before it was cut free, the Chinese foreign ministry said. 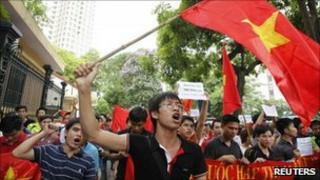 China accused Vietnam of "gravely violating" its sovereignty and warned it to stop "all invasive activities". The BBC's Southeast Asia correspondent Rachel Harvey says that military drills are not usually given such advance public prominence and the timing is extremely sensitive. A Vietnamese naval officer said the "routine annual training" exercises have "nothing to do with the recent incidents involving China". The first part of the nine-hour drill was held near the island of Hon Ong - well within Vietnamese territorial waters. A second phase of live firing lasting about six hours is being staged at night, officials said. Shipping has been warned to stay clear of the area. China has not commented officially on the naval exercises, but a newspaper controlled by the Chinese Communist Party, the Global Times, said the drills were "a military show of force to defy Beijing". Demonstrations have been held in Hanoi for the second weekend in a row, calling for China to get out of Vietnam's territorial waters. Demonstrations are not usually tolerated in Communist Vietnam, but the authorities appear to be allowing protests related to the South China Sea dispute, our correspondent says. The Philippines, Malaysia, Brunei and Taiwan also have rival claims in the area. The US has also expressed concern about China's rising naval ambitions.